← Try a Twitter Board! 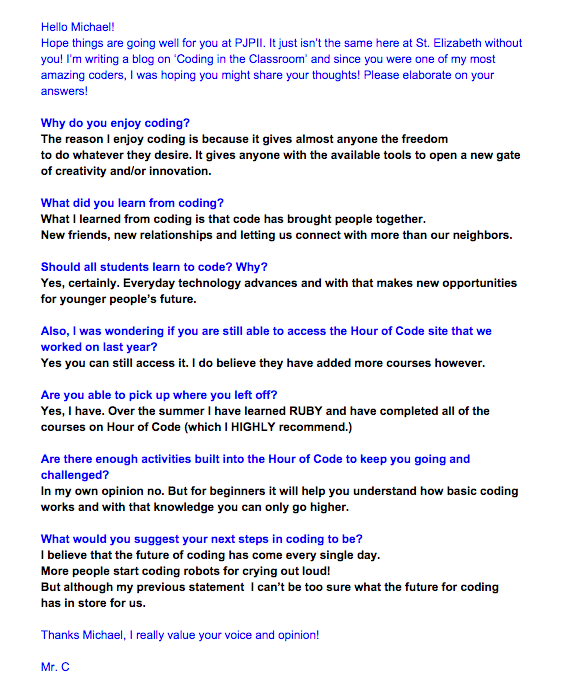 Coding In the Classroom: What I Learned from my Students! Although I had little idea what I was getting myself into, #TBCDSB Technology Resource Teacher, Jerry Izydorczak and I endeavoured to introduce my grade 6 students to coding. At the very moment they started, our digital natives became the lead learners and “teachers”. Mr. I and I quickly became the students who were struggling to keep up and understand the language of coding that my students so quickly adopted! I truly started to feel what many of my students might experience on a daily basis; frustration, incompetence and the feeling of being left behind. My students couldn’t quite understand why I wasn’t “getting it” and had a difficult time explaining a language that they seemed to so easily understand. So, I took a deep breathe, reminded myself that I didn’t always need to be the “teacher” and let go. I took the back seat in this learning journey, realized I didn’t have to “get it”, that the language of code would come in time if I was willing to take risks, ask questions, fail, ask questions, learn, ask questions and try again. I also recognized that some of my students who tended to struggle with “traditional” school assignments excelled in coding. There was a spark in their eyes that I had never seen before. A role reversal started to transpire. The one’s who were sometimes quick to give up, rush through their work or not put forth the effort they were capable of began to flourish. Some of my most reserved students started to take leadership roles within the classroom during “coding time”, they became the sought after “go to people” to assist their peers to get through a challenging stage. Coding was the boost that some of my students needed to spark their learning and give them a shot of confidence and passion for learning. It gave some of my other students, some of the ones that things always seemed to come easily, the challenge they needed to allow them to fail, persevere and succeed. As the Hour of Code movement begins again this December, I encourage you to jump in and expose your students to a different learning opportunity. However, once the “hour” is done, your students will want and need more! Are you ready and willing to give it to them? Don’t stop there, continue to look outside the covers of the textbooks and the walls of your classrooms, the opportunities for learning are endless! 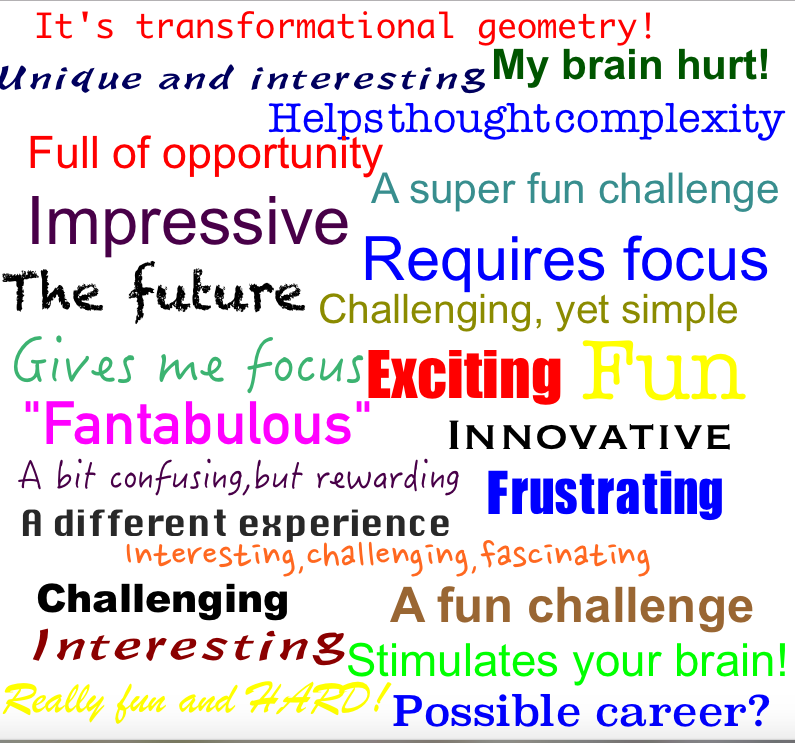 3 Responses to Coding In the Classroom: What I Learned from my Students! I experienced coding for the first time at a student GAFE summit in Superior North Catholic District School Board just this week. Students were immediately drawn to it! I showed my own grade 6 daughter and she has asked repeatedly to work on her Hour of Code. I look forward to seeing more of it in Thunder Bay Catholic! Wow, Pete. Very inspiring and enlightening. I like the opportunity you took to pay attention to your own feelings during the task and truly use them to empathize with your students. That is not an easy task and not everyone can do it, but you did.